Canal Blvd, before construction on the Cemeteries Terminal began. 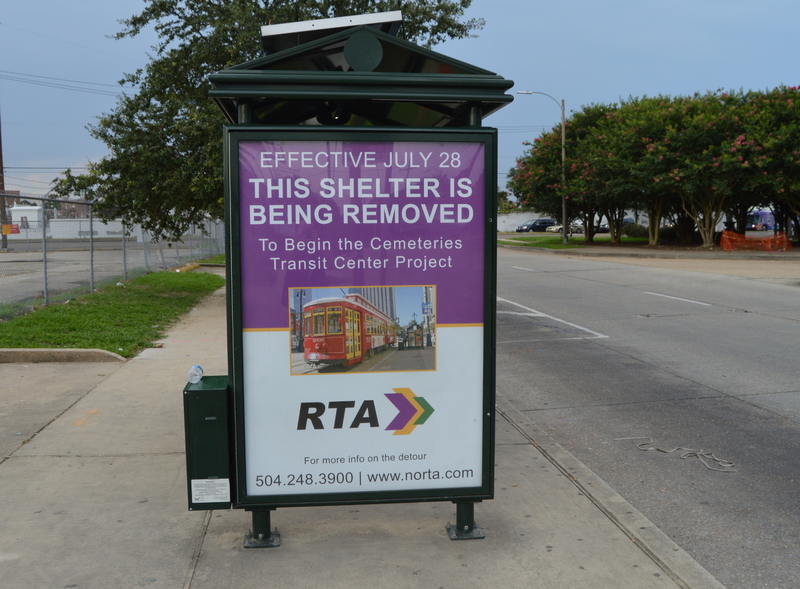 The terminal at the foot of Canal Street, NORTA Cemeteries Terminal, is nearing completion. Construction began back in August, and it all appears to be coming along on schedule. When the Canal Street line opened in 2004, the NORTA Cemeteries Terminal was a single-track affair. The outbound and inbound tracks merged to one. The operator changed the poles at the terminal, and went back downtown on the inbound (right-hand side if you’re looking towards the river) track. When the line switched to buses in 1964, the terminal was two-track. It looked like the terminal at S. Carrollton and S. Claiborn Avenues. Canal Street’s auto traffic increased over the years, so they city cut back the neutral ground at the foot of Canal. There wasn’t enough space left to build a two-track terminal. The additional traffic presented an additional complication. Streetcar riders were trapped in the middle of an incredibly busy intersection. Crossing Canal Street on either side is dangerous for pedestrians, even with crosswalks and Walk/Don’t Walk signs. The city always planned for the NORTA Cemeteries Terminal to be temporary. 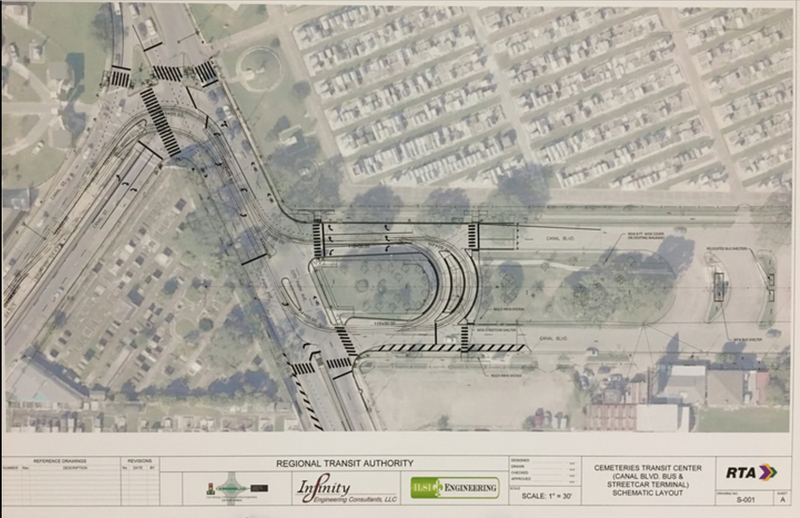 The original funding for the Canal Street line included $10M to build an off-street terminal. The best plan called for outbound streetcars to make a right-turn onto City Park Avenue, travel that street for a block, then turn left onto Canal Boulevard. The actual terminal would be in that first block of Canal Blvd. The streetcars would loop around, go up City Park Avenue for a block, then left-turn onto Canal Street for the inbound run. The residents of Lakeview fought the project for over ten years, complaining that the construction would inconvenience them. Liability issues, combined with the possibility of losing the federal money forced NORTA’s hand. The project got the green-light earlier this year. This is Canal Street, looking lakebound, with Greenwood Cemetery in the background. The track and overhead catenary is fully double-track. Moving up from the last photo. The track and overhead wires make a right-turn at City Park Avenue from Canal Street. Streetcars haven’t turned right onto City Park Avenue since belt service ended in 1932. The view from City Park Avenue. Looking down City Park Avenue, towards Canal Boulevard. The track is complete, and a test run of a 2000-series streetcar took place this morning. Canal Street, from City Park Avenue. Looking back on Canal Street, from City Park Avenue. Canal Street line terminal on Canal Boulevard. The end of the line on Canal Boulevard. This design allows riders to get off the streetcar, then board buses, without having to cross busy streets. Now that all the track is complete, we’ll try to get photos of Von Dullens on the move!